India is in election storm today. The election results of the five Indian States have been just announced. These results have been rather alarming to the ruling party National Democratic Alliance (NDA), led by the Bharatiya Janata Party (BJP). The Congress seems to be coming back. Prime Minister (PM) Narendra Modi and the BJP President Amit Shah were not expecting such results. A meeting was convened on emergency basis to take a stock of the situation, identify the threats and refine the strategy for the national election of 2019. All key ministers, strategists and senior party workers were present. My Professor friend, who is the secret advisor to the PMO got me in as his assistant. After the PM made opening remarks showing his surprise as well as concerns, Mr Amit Shah presented his analyses assuring all that the results of the State elections should interpreted carefully, and he does not see a swing to the Congress at the national level. Mr. Amit Shah said that the trend observed in the five States indicates that the regional satraps might play key roles in 2019 general elections. He presented a State-wise statistic that was a complex mix of caste and class equations. He ended showing his concern about the attempts by non-BJP parties to put a united front against Prime Minister Narendra Modi’s bid for a second term. A Mahagathbandhan (Grand Alliance) was conceived. The driving force behind the Mahagathbandhan was Andhra Pradesh Chief Minister N Chandrababu Naidu, who was making efforts to put together an anti-BJP front after walking out of the Modi government. Congress president Rahul Gandhi, West Bengal Chief Minister Mamata Banerjee, former Union minister Sharad Yadav, National Conference leader Farooq Abdullah, Samajwadi Party leader Ram Gopal Yadav, Janata Dal-Secular Chief H D Deve Gowda, Nationalist Congress Party’s Sharad Pawar, DMK’s M K Stalin, Samajwadi Party chief Akhilesh Yadav and Bahujan Samaj Party leader Mayawati were to be part of the Mahagathbandhan. In this Mahagathbandhan, the position taken by the Bahujan Samaj Party (BSP) was going to be critical. 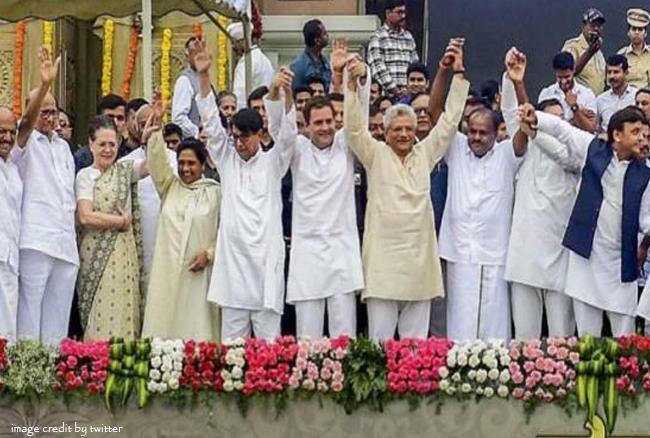 The parties in Mahagathbandhan were planning to focus on issues related to farmers, demonetisation and the controversial Rafale deal. PM asked the senior members of the party to react to Mr. Amit Shah’s presentation and the Mahagathbandhan. Mr. Suresh Prabhu who was earlier Union Minister of Environment & Forests spoke. He said that his informers have reported that there is a yet another Mahagathbandhan getting formed, something that has been quietly brewing over last five years with a potential to grow across the States, religions and casts, rich and poor. He said that this New Mahagathbandhan should not be neglected and more investigation is required to know who are involved and what will be this Mahagathbandhan’s election manifesto. All he came to know that this New Mahagathbandhan (Green Alliance) is basically pro-environment or green and is led by illustrious people of India, leading the field of environment, pollution and social justice. Perhaps, Mr. Jaitley’s response to Mr. Suresh Prabhu was good enough and the members did not discuss further about the threat of the Naya Mahagathbandhan. The meeting focused more on the Naidu led Mahagathbandhan and discussed how to ensure that this Mahagathbandhan does not happen. When we were returning, Professor asked me to come to his house for a chat. We sat in his library with a south Indian coffee. He lit his cigar. Any party or politician is labeled “green” if it emphasizes environmental causes. The Global Greens Charter lists six guiding principles which are ecological wisdom, social justice, participatory democracy, nonviolence, sustainability and respect for diversity. Imagine if these principles are listed in the election manifestos of NDA or the Congress! But these principles are so hard to communicate and convince both the rich and poor of India. Of course we all are looking for roti, kapda aur makaan. Imagine, if the Naya Mahagathbandhan of greens gets formed and works in coalition with the ruling Government. Imagine if the greens were to manage few critical portfolios for protecting, preserving and enhancing India’s assets of natural resources – apart from all the gold and cash reserves the RBI has! Will we see an emergence of greens on India’s political canvas? But again, I was not sure whether the greens will function in a balanced manner considering both economic development of the country and balance with protection of the environment. The experience in India as well as in other countries has been rather uneven. I stayed silent. I must be dreaming. “This will never happen Dr Modak, let me be frank with you” Professor broke the silence while looking outside the window. “Do you know that Vasundhara Raje ordered broadening of roads and beautification of the cities by removing the encroachments. In the process, several temples, many of them makeshift ones, were either demolished or removed. This angered the Hindus who thought the BJP was working against the interests of the majority community. And was one of the factors why BJP lost to congress apart from the promise of the loan waivers that Rahul Gandhi made”. “Dr Modak, this country does not have today any strong national association of professionals, environmental NGOs and academia on the subject of Environmental Management. There is no towering national body that can take on the Government if there is need to be – in the interest of environment. So, forget your hope for the Naya Mahagathbandhan” Professor gave me a kind smile and extinguished his cigar. Professor was right. Good initiatives even in the interest of environment do not get recognized or supported as what is green for someone is perhaps brown for someone else! Your sense of humour is phenomenal. I look forward to your blogs that come in my inbox.